Gaana.com, one of the leading online music streaming service from Times Internet has today announced acquisition of Independent music streaming songs portal Musicfellas.com. The acquisition is aimed at brining Independent music on Gaana.com. Upon acquisition, founders of Musicfellas will join the Gaana team to drive their mobile app initiatives. Musicfellas was founded by Mayank Jain, Gaurav Shahlot and Shubhranshu Jain in mid 2012. It later for funding from TLabs, a technology accelerator and seed fund run by Times Internet. Musicfellas currently has over 700 Indie music artists across the globe, and is currently the leading platform for streaming Indie music in India. This is an excellent acquisition from Gaana’s perspective – They now are the only platform (among leading ones like Dhingana & others) who will have Indie music available. It not only helps them expand their collection, they also do not have to worry about song licensing as is the case with traditional songs. Another positive for Gaana is that they are getting talented team of founders that will come on board to drive the App Ecosystem on Gaana. Even from Indie music creators, it is great news, as they will now have much wider audience to whom they can showcase their talent. Overall, a great strategic acquisition by Gaana! 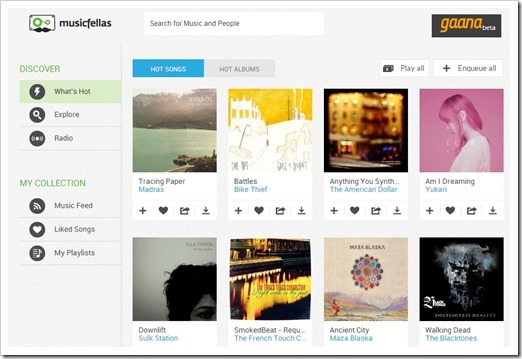 "Gaana.com Acquires Musicfellas.com; Brings Independent Music On Its Platform! ", 5 out of 5 based on 1 ratings. I think, Gaana has done a great acquisition and this would surely take them away ahead in the competition league, they are taking the right steps going forward.